You can listen to samples and download the soundtrack here. I wonder if it’s coz they were the people who introduced me to the genre, I tend to do a mental comparison with McLaughlin & Co.’s Shakti (old+new) every time I listen to a carnatic-jazz fusion album. The thing with works like Shakti’s — and I say this as a person who is first a listener of Indian classical and then a jazz enthusiast — is that they have always favored the classical ear more, giving a slight upper hand to the classical portion while the jazz played second fiddle (or guitar, as the case may be! 😉 ), or there is at least a balance between the two. 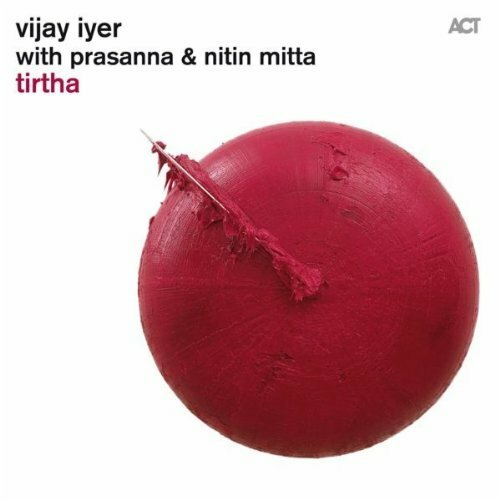 In Tirtha however — and I am guessing this is due to the Grammy-nominated lead composer Vijay Iyer’s jazz background (this is my first work of Vijay so I can’t be sure) — the jazz elements seem to sideline carnatic to quite an extent. The album surely leaves one in no doubt regarding the individual brilliance of the artists. Guitar Prasanna is awe-inspiring in his ability to juggle ragas, and migrate from carnatic to jazz and then back again, in a seemingly effortless fashion, while Vijay Iyer proves why is counted among the most promising jazz pianists of the age. Nitin Mitta’s role is understated most of the time, but when he comes to the fore he does it in style, like in the konnakol and solos of Tribal Wisdom. But there are times when the elaborate display of talent turns the song into a convoluted mass, like with Duality, the opening song. The song has the players following a complex time signature which tells big time on the listenability of the track. Ditto for Polytheism, the difference being that what was done to the time signature is done to the tone in this case. Even the title song has portions where the artists get into wild complicated improvs, but they wonderfully make up in the other sections, especially the change in tempo towards the end. Tribal Wisdom is the longest track of all, but has its length beautifully divided among the three artists. Abundance is sedate, Prasanna and Iyer cautiously finding their way forward over Mitta’s mellow percussive template. The song also features a brief vocal segment towards the end, (presumably from Prasanna) following the guitar notes. Falsehood is another slightly toned-down track, Prasanna two-timing between jazz and carnatic modes. Gauntlet is short, racy and intriguing. And wonderfully executed. The two final tracks, Remembrance and Entropy and Time, are pretty much vintage Guitar Prasanna, Vijay Iyer letting the guitarist hog the centrestage for most part. While in the former there is a bit of jazz creeping up into Prasanna’s intricate guitaring, the latter is delightfully carnatic (barring a short piano segment), the guitarist revelling in the exploration of raga Bilahari (guess). So the summary of the comparison? The carnatic fan side of me is still left wanting, I more of it was expected out of an album involving Guitar Prasanna. The fusion aficionado in me is pretty happy, though this definitely is not among the best jazz carnatic fusion albums I have listened to. Again, my views are greatly influenced by the classical side of things. The jazz fans might find this album to their taste but I cannot be sure of that. Yes there are some very good tracks, but in entirety it did not impress me as much as, say, another recent jazz fusion album I heard, Bada Boom. Shall be trying and listening to Vijay Iyer’s older works though, and be on the lookout for Nitin Mitta, he is good.